The scientific objective of the benchmark is to evaluate current available procedures which may be applied in the fields of active vibration control and noise control. The benchmark specifically will focus in testing: 1) performances, 2) robustness and 3) complexity. 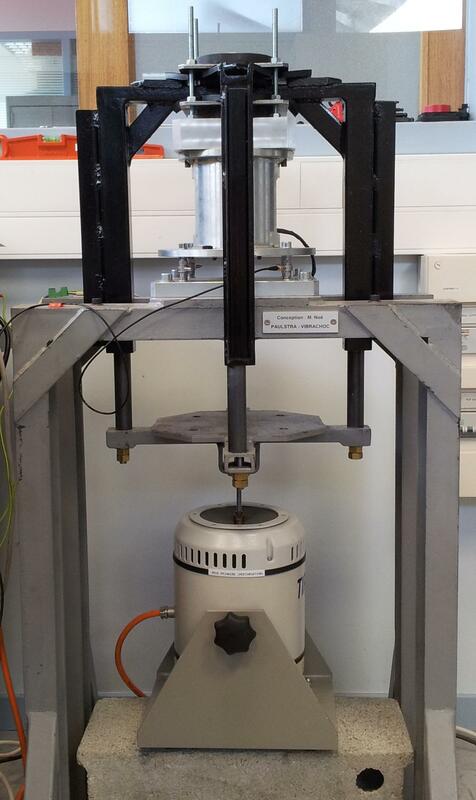 The test bed is an active suspension using an inertial actuator and equipped with a shaker and a measure of the residual force. It is located at GIPSA-Lab, Grenoble (France) which has already experience on organizing benchmarks on test beds (see European J. of Control, no.2, 1995 and no.1, 2003). The disturbances are unknown/time-varying multiple narrow band disturbances located in a given frequency region. The plant model is (almost) constant. An identified model of the plant is provided. Further identification procedures can be carried on demand. A discrete time Matlab Simulink simulator of the plant is provided. The participants should give a Simulink simulation including complete control scheme built around the given model. The "test" protocol is available to the participants. The simulation should be compatible with the Matlab xPC Target environment, which will be used for real-time implementation on the test bed of the proposed solutions. The real-time implementation and experiments will be carried on by the GIPSA-LAB staff. Final evaluation will be performed on the basis of real-time results. For the EJC special issue the deadline is January 1st, 2013 (Submission closed). I.D. Landau, T.B. Airimitoaie, A. Castellanos-Silva, J.J. Martinez-Molina, M. Alma, G. Buche (GIPSA-Lab, Control Dept., Grenoble, France), A. Karimi (Automatic Control Lab., EPFL, Lausanne, Switzerland).